Originally I had marked the photograph as unknown, but by making comparisons with other photographs in the album, I believe the individual on the left to be John Walker. A previous blog post on John Walker by David Scott [Carte de visite] shows John Walker in 1876. Research by +Paul Cooper has revealed that Walker arrived in New South Wales during 1876. This particular photograph appears to show a slightly older Walker. 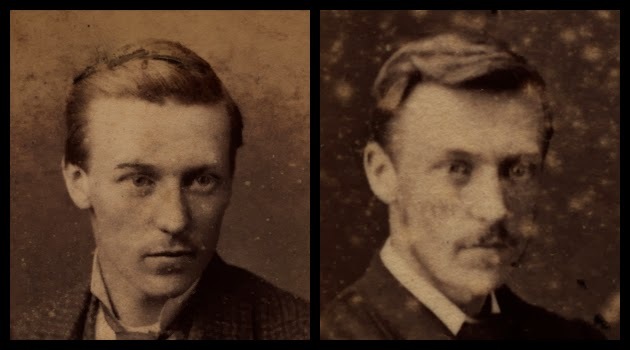 A close-up comparison follows and shows John Walker in 1876 (left side) compared to John Walker in this photograph (right side). For dating purposes and based on the above comparison we could assume approximately five years plus or minus two years between photos. 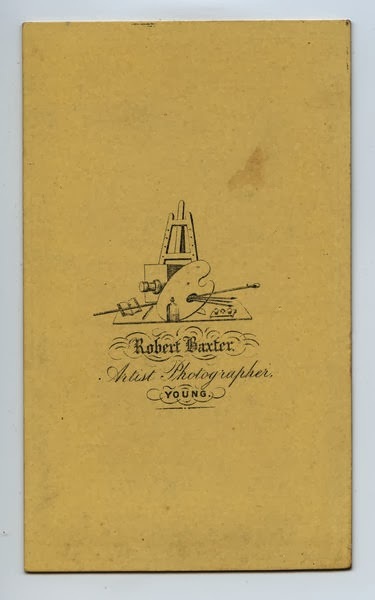 Researching the photographer Robert Baxter has been elusive, but Sandy Barrie's fantastic book and resource titled Australians Behind the Camera - Directory of Early Australian Photographers, 1841 to 1945 has been invaluable. It appears Robert Baxter was a travelling photographer who operated under his own name throughout the period 1870 to 1903. He is recorded in the following regional towns of southern New South Wales - Campbelltown, Yass, Coma, Queanbeyan, Young, Merimbula and Wollongong. 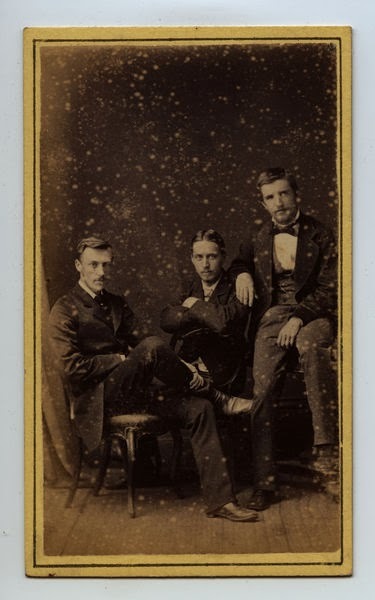 In regards to operating from Young, where this particular photograph was taken, there are two time periods listed in Sandy Barrie's publication - December 1873 to January 1875 as well as during the year 1880. Taking the dates that Robert Baxter was in Young and overlaying the information when John Walker arrived in Australia, we can date the photograph to the year 1880. Barrie, Sandy (2002). Australians Behind the Camera - Directory of Early Australian Photographers, 1841 to 1945. S. Barrie. Sydney South.